A unique new pillow for frequent travellers! The Squishy Deluxe Microbead Convertible Travel Pillow is a unique pillow which transforms from a U-shaped neck pillow to a cyllindrical bolster pillow. 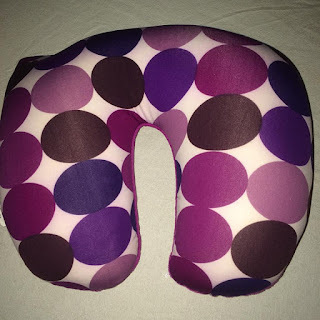 As a neck pillow it's perfect for supporting the neck and shoulders during travel. As a bolster it can be used in a variety of situations; as a sleeping pillow, for back support during travel or as a decorative pillow on the couch. Filled with high quality polystyrene microbeads, this wonderful pillow provides firm yet gentle support to your back, head and neck, allowing tired sore muscles to relax and release tension. Hypoallergenic resistant to mold, mildew and allergens. I love this pillow! Its amazing and the fact that it can be changed to a tube as well so I can use it when laying down. When I sit on my couch I don't have a lot of neck support and this is great for when I want to relax on the couch. Its really good for road trips in the car as well.